President Trump extended the review period established by E.O. 13761, which set forth criteria for the purpose of sanctions on Sudan. The President’s executive order extends the review period for an additional three months. Sudan is expected to stop fighting in conflict areas around the country, improve humanitarian access, and maintain its cooperation with the U.S. to reduce the threat of terrorism. If they do all three things, the U.S. will remove its sanctions on the Government of Sudan. That means the U.S. would, once again, trade with Sudan so long as they pass their three month review. The president signed an order to enhance America’s leadership in space exploration. The new order revives the National Space Council, which was last active in 1993. “Today’s announcement sends a clear signal to the world that we are restoring America’s proud legacy of leadership in space,” Trump said. Members of the council, which will be led by Vice President Mike Pence, will include the Secretaries of State, Defense, Commerce, Transportation, and Homeland Security, as well as the head of NASA, the chairman of the Joint Chiefs of Staff, the National Security Adviser, and the Director of National Intelligence. An executive order about an executive order? Let us explain! E.O. 13597 was signed in January of 2012 and tried to expedite the processing time for non-immigrant visas, like those needed by students and tourists. This new order reverses that Obama-era guideline, potentially increasing the wait time for visitor visas to the U.S. The order was made in the interest of “vetting” and national security. It is not immediately clear how much longer the process will now take for the millions of tourist, student, and business visa seekers who apply to travel to the U.S. each year. The order aims to fill what it says are 350,000 currently unfilled positions in the U.S. that are open because people do not have the training to complete them. The Federal Government will provide more affordable paths to secure higher paying jobs by promoting apprenticeships and effective workforce development programs. The Secretaries of Labor, Education, and Commerce will work together to create apprenticeship programs, with the help of third parties, like non-profits, unions, and trade groups. That will substantially increase the number of U.S. apprenticeships from the current 500,000 by doubling the amount of money the federal government spends on apprenticeship programs. President Donald Trump established the “Presidential Advisory Commission on Election Integrity (Commission).” Vice President Mike Pence will chair the commission, made up of no more than 15 people. President Trump will appoint the members, who will have experience in elections, election management, election fraud, etc. The commission’s mission will be to study the registration and voting process used in federal elections and submit a report to the president, making sure all laws, rules, policies, activities, strategies, and practices that “enhance the American people’s confidence in the integrity of the voting process” are followed. This executive order was established as a result of recent cyberhacks and what the Trump administration is calling “antiquated and difficult-to-defend information technology.” Government agencies will now be held accountable by the President for implementing risk management measures equal to the risk and magnitude of the harm that would result if the agency was hacked. Each agency will use a new “Framework,” short for “Framework for Improving Critical Infrastructure Cybersecurity,” which was developed by the National Institute of Standards and Technology. President Trump signed an executive order that could allow churches and other religious organizations to become more active politically. The order, which Trump inked during a ceremony in the White House Rose Garden, directs the IRS to exercise “maximum enforcement discretion” over the Johnson amendment, which prevents churches and other tax-exempt religious organizations from endorsing or opposing political candidates. It also provides “regulatory relief” for organizations that object on religious grounds to a provision in Obamacare that mandates employers provide certain health services, including coverage for contraception. The White House announced May 1, 2017 that President Trump signed an executive order establishing an American Technology Council to help the government “transform and modernize” its digital services. The Council falls under the White House Office of American Innovation led by Trump’s son-in-law Jared Kushner. According to the order, the president will preside over the council’s meetings. The ultimate goal: “coordinate the vision, strategy, and direction” and “advice to the president related to policy decisions” regarding the federal government’s use of information technology. The executive order would call for a sweeping review of the United States’ free trade agreements, stating that “all trade relations and trade preference programs of the United States, should enhance our economic growth, contribute favorably to our balance of trade, and strengthen the American manufacturing base. Trump has often spoken about such agreements, like NAFTA and the World Trade Organization. According to White House Office of the Press Secretary, the mission of the order is to “defend and serve American workers and domestic manufacturers,” while advising the President on policies to increase economic growth, decrease the trade deficit, and strengthen the United States manufacturing and defense industrial bases. The order directs Secretary of Education Betsy DeVos to study federal overreach in local and state education systems. Within 300 days, DeVos will determine whether federal education regulations take control away from states in areas such as curriculum, school administration, and textbook/library content. This order directs the review of federally designated lands to determine if the federal government should give up ownership to states. Specifically, the review considers all national monuments designated after 1996 that are 100,000 acres or larger. That places 24 national monuments in jeopardy of losing their National Park protection status, including the Grand Canyon-Parashant National Monument in Arizona, the Giant Sequoia National Monument in California, and the Rio Grande del Norte National Monument in New Mexico. This order creates a task force, led by Secretary of Agriculture Sonny Perdue, that will identify policy options to promote job growth and agricultural business in rural America. The task force will look at regulations that impede agricultural growth and for ways to encourage the use of agricultural products made in America; the task force will submit a report to the president within 180 days. As you can tell by its name, this order has two parts. The “Buy American” part directs agencies to tighten rules that give priority to U.S. companies when hiring contractors or purchasing goods. The Secretary of Commerce must submit a review of “Buy American” loopholes within 220 days. The “Hire American” part targets the H-1B visa program, which lets businesses hire high-skilled workers from outside the U.S., by placing less emphasis on the lottery system used to determine which companies can sponsor visas. This was the second Executive Order dealing with trade President Trump signed on March 31st. The order directs the Secretary of Homeland Security to develop a plan within 90 days to combat two types of non-trade barriers placed against the U.S. The two types are anti-dumping and countervailing duties. It also directs the DHS Secretary and Treasury Secretary to step up seizure of counterfeit goods and protect American companies from intellectual property right infringement. This order changes the succession line for the Attorney General Jeff Sessions. The new sequence is: U.S. Attorney for the Eastern District of Virginia, U.S. Attorney General for the Eastern District of North Carolina, and the U.S. Attorney for the Northern District of Texas. This was one of two executive orders dealing with trade the president signed on March 31st. It directs the Commerce Department and U.S. Trade Representative to compile a report on trade practices that contribute to the trade deficit. The report will look at each of America’s trade partners and assess whether the country’s trade practices unfairly discriminate against the U.S. Forms of discrimination include: non-tariff barriers, anti-dumping, and intellectual property theft. The Commerce Department will send a report to the president detailing the causes for the U.S. trade deficit within 90 days. This order creates the “Commission on Combating Drug Addiction and Opioid Crisis.” The group will study the federal government’s effectiveness in fighting drug addiction by reviewing funding levels, accessibility of treatment services, prescription practices, and youth educational messages. The commission will send a report to the president within 90 days. New Jersey Governor Chris Christie will head the commission. The Trump administration touts this order as both “protecting the environment and promoting the economy.” It rescinds the Obama administration’s 2013 Executive Order “Preparing the United States for the Impacts of Climate Change” and three of Obama’s presidential memoranda issued in 2013, 2015, and 2016, aimed at reducing carbon pollution from the power sector, protecting natural resources, and addressing climate change-related impacts as part of U.S. national security policy. It also rescinds President Obama’s 2013 Climate Action Plan, focused on reducing carbon pollution and methane emissions. This order revokes all or part of three previous executive orders concerning federal contracting. Companies receiving large federal contracts no longer have to demonstrate that they have complied for at least three years with 14 federal laws, several of which prohibit discrimination based on sexual orientation, gender stereotyping, or gender identity. The new Executive Order is in line with the Trump Administration’s stated goal of rolling back many Obama-era federal regulations. This is President Trump’s simplest and shortest order yet. It tells the Director of the Office of Management and Budget to develop a plan for improving the efficiency, effectiveness, and accountability of the federal government. This person’s job is to cut “unnecessary” agencies, meaning anything he or she believes could be better handled by states or private firms, anything redundant, anything that’s not cost-efficient, adn anything that wouldn’t cost too much to shut down or merge with another agency. Read more about this Executive Order here. This Executive Order moves the federal initiative about Historically Black Colleges and Universities (HBCUs) into the White House, from the Department of Education, where it was located under former President Obama’s administration. It creates a President’s Board of Advisors on HBCUs, although much of the budgeting and administration will stay with the Department of Education. This order targets the “Clean Water Rule” by instructing the EPA and Army Corp of Engineers to “review and reconsider” the rule. No additional specifics have been provided, but another executive order pertaining to this is expected. The “Clean Water Rule” was implemented in 2015 and was intended to clarify which of the nation’s waterways should be protected under the Federal Clean Water Act; it includes streams, wetlands, and other small waterways that collectively provide drinking water for an estimated 117 million people, 1 in 3 Americans. This order directs heads of departments and agencies to designate a “regulatory reform officer” to oversee implementation of regulations and identify needed changes. The order calls for each federal agency to create a task force to review existing regulations and make recommendations about which should stay, which should be modified, and which should go. Trump has called for a major overhaul of government regulations, saying they stifle economic growth. The order changes the order of succession for Attorney General. The sequence is now: the U.S. Attorney for the Eastern District of Virginia, the U.S. Attorney for the Northern District of Illinois, and the U.S. Attorney for the Western District of Missouri. Jeff Sessions is currently serving as Attorney General, taking office on February 9, 2017. Just a week before leaving office, former President Obama signed an executive order changing the order of A.G. succession without explanation. The order identifies human trafficking, drug smuggling, cyber-crime, financial crimes, and corruption as threats to “public safety and national security.” It instructs the administration to cut down on organized crime (like gangs and cartels) by increasing cooperation with foreign governments and the way they share information and data. The “Threat Mitigation National Intelligence” will lead this initiative, and will deliver a report to President Trump within 120 days. Attorney General Jeff Sessions, Secretary of State Rex Tillerson, and Secretary of Homeland Security John Kelly serve on the “Threat Mitigation National Intelligence” committee. The order calls on the Department of Justice to “enhance the protection and safety” of law enforcement by increasing the penalties for crimes committed against police officers. The Attorney General oversees this order, and is instructed to determine whether existing laws adequately protect law enforcement. If they are not found to do so, the Attorney general must propose legislation to better protect officers. tion and violent crime. The newly-assembled task force will submit a yearly report to President Trump. The order says the government must cut two regulations for every one, new regulation proposed. Regulations cannot cost anything, meaning any costs associated with regulations must be offset by eliminations. The head of each agency must keep a record of the money saved under this order, and they must send those reports to the president. The order prevent executive branch officials from lobbying for five years after leaving office. It also places a lifetime ban on lobbying a foreign government. The order bans appointees from accepting gifts from registered lobbyists and bans appointees who were lobbyists from participating in any issues they petitioned for within the last two years. The order temporarily suspends the entry of immigrants from seven Muslim-majority countries: Syria, Iran, Iraq, Libya, Sudan, Yemen, and Somalia, for 90 days. All refugees are barred from the country for 120 days. Syrian refugees, in particular, are banned indefinitely. During the ban, the Secretary of State and the Secretary of Homeland Security will revise the refugee admission process. After this order was signed, thousands of Americans protested at airports across the country. The order directs federal funds towards construction of a wall along the U.S.-Mexico border. It calls on the Secretary of Homeland Security to prepare congressional budget requests for the wall. The order also instructs the government to hire 5,000 more Border Patrol agents, to build facilities to hold undocumented immigrants near the Mexican border, and to end “catch-and-release” protocols. The order strips federal grant money to “sanctuary cities.” It also orders the Secretary of Homeland Security to hire 10,000 more immigration officers, create a weekly list of crimes committed by undocumented immigrants, and review immigration policies. The order also creates an office to assist victims of crimes committed by undocumented immigrants. Local and state police must now detain people they find that came to the United States illegally. The order explains how the Trump administration will expedite environmental reviews and approval of “high priority” infrastructure projects, like bridge, airport, and highway repairs. The order instructs the Chairman of the Council on Environmental Quality to determine a project’s “environmental impact” and decide whether it’s “high priority” within 30 days of a request. This was issued in response to protests against the Dakota Access Pipeline. 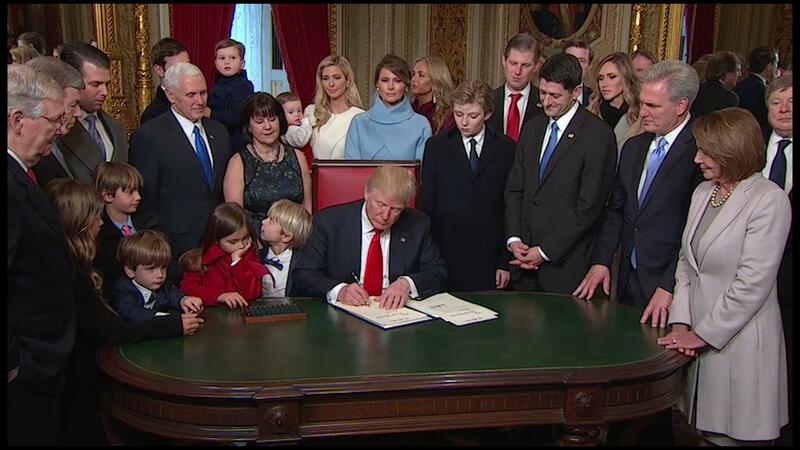 Trump signed his first order hours after taking the oath of office. It’s aimed at reversing the Affordable Care Act, President Obama’s landmark legislation. The order says the Trump administration will “seek prompt repeal” of the law. It weakens parts of the law, instructing the Secretary of Health and Human Services and other agencies to “waive, defer, grant exemptions from, or delay the implementation” of any part of the law they think places a financial burden on the government. 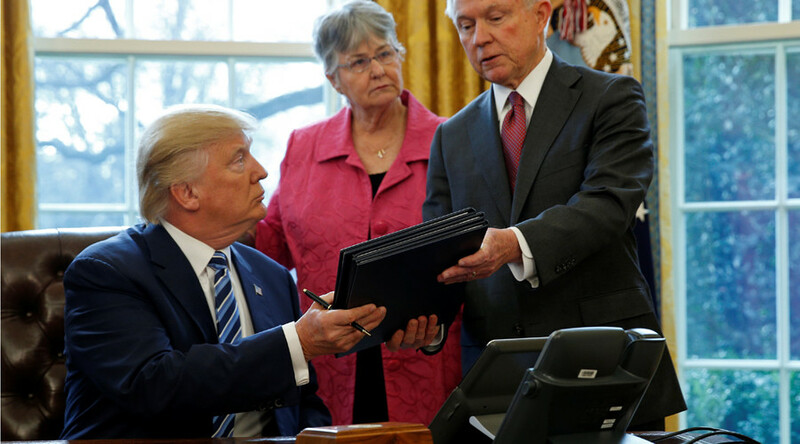 Topics: 2016, 2017, attorney general, congress, court, courts, election 2016, executive order, Executive Orders, First 100 Days, jeff sessions, Laws, president, President donald trump, protest, travel ban, Trump, united states, washington d.c.